- Blanch spinach leaves in boiling water for around a min. Drain and put them in a bowl of ice-water. - Take onion and tomato cuts in mixture jar and grind to make a smooth paste. - Similarly, make a fine puree of spinach too using less amount of water and keep it aside. - Heat oil in kadai and add ginger-garlic paste with chopped green chillies and saute it for a while. - Add tomato-onion gravy into it and cook it on medium-high heat for around 2-3 mins. - Add spinach puree and all the seasonings. Mix well and cook till gravy comes to boiling point. 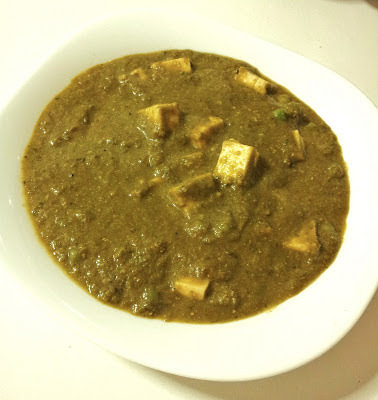 - Cut the paneer slab into cubes and add it in kadai. 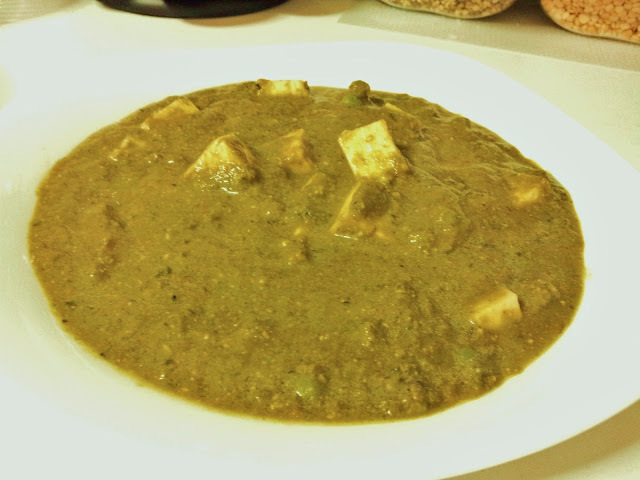 - Coat all cubes with green gravy and transfer it to a serving bowl. - Optionally, can be garnished with full cream on top.